Jennifer Potter Hayes, executive director of View, has announced the receipt of a large donation to the art center’s Moving Mountains campaign for debt retirement. The gift will allow View to retain the property at 3260 State Route 28 that housed the former Arts Center/Old Forge for nearly 40 years. The restricted gift is for $365,000 and is pledged over a five-year period. The benefactors are a couple who have been long-time supporters of View, who wish to remain anonymous. According to Potter Hayes, the gift agreement allows View to retain the deed to the property and use it for mission related activities. It is her hope that by placing the property back in productive use, it will generate additional revenue for View. The original concept for an Arts and Sciences complex on Route 28 in Old Forge included the use of the former Arts Center property in its plan. This entry was posted in admin on December 20, 2012 by admin. 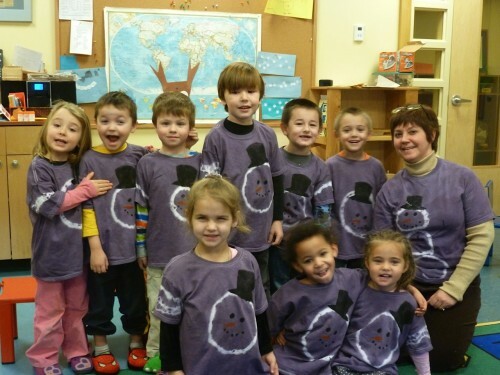 The four-year-old students of the Kinderwood Pre-School program model the tie-dyed purple t-shirts with stenciled snowman faces they made as a holiday craft project this week. Head teacher Diane Heroux said the students will be taking a little holiday break before returning to school on January 2nd. Pictured from left, back row, are C. Armendola, G. Gardner, C. Langworthy, A. Krantz, W. Parent III, Head Teacher Diane Heroux. Front row: A. Hitchcock, H. Stokes, and S. Helmes. Old Forge Properties, which includes Enchanted Forest Water Safari and Water’s Edge Inn and Conference Center, was recently awarded a grant for $1 million to help offset the costs of converting their heating systems to a wood chip boiler system. The grant was awarded by NYSERDA through funding that was made available in the second round of Regional Economic Development Council Awards which were announced through Governor Andrew Cuomo’s office on Wednesday, December 19. The new system is expected to save Old Forge Properties an estimated $84,000 to $110,500 per year while offsetting 451 tons of carbon emissions annually. It will bring carbon dioxide emissions down to zero and allow for nearly 750 tons of locally produced woodchips annually. And because the waste generated is not considered a hazardous material, it can be used as a soil amendment to lawns and gardens. A feasibility analysis that was conducted by the USDA Forest Service found that this project should produce a positive cash flow quickly, which will allow Old Forge Properties to continually invest, create new jobs, and attract additional visitors to Herkimer County. “That’s going to be a great, great project for the community. The Noonans (owners of Old Forge Properties) are really to be commended for that project,” said CAP-21 Executive Director Nick Rose. This entry was posted in admin and tagged Dana Armington on December 20, 2012 by Dana Armington. CAP-21 recently secured a grant for the Town of Inlet in the amount of $248,000 to assist with the continued improvements to Arrowhead Park. The grant was awarded through the Department of State in round two of the Regional Economic Development Council Awards that were announced on Wednesday, December 19. The grant money will be used to make improvements throughout Arrowhead Park that includes enhancements to the public restrooms, landscaping, lighting, parking and sidewalks, as well as the reconstruction of surrounding buildings. The tennis courts will also be relocated to help increase green space at the park. “This is huge news—and somewhat unexpected due to recent issues that have occurred downstate,” said Inlet Town Supervisor John Frey. Frey said they will have three years to build, spend down and match the award. He thanked CAP-21 Executive Director Nick Rose, and Inlet residents Margie and Bruce O’Hara for getting the project started. The late Dr. Dwight Webster, a professor of Fishery Biology at Cornell University, first came to the Adirondack League Club (ALC) in 1950 as a private consultant. At the time, fishing throughout the Adirondacks had declined greatly for a number of reasons and his mission as a consultant was to improve the fishing in local ponds, lakes and streams. 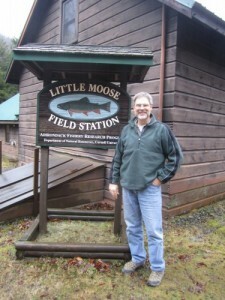 He was later invited to consult in other Adirondack locations as well, and his work developed into a major research program with involvement by Cornell University and a broader base of landowners. With a field station at the Adirondack League Club (ALC), this Adirondack fisheries research program is still going strong 62 years later. In the 1950’s to1960’s, the effects of acid rain were already being felt, but the problem had not been identified. Studies on fish were a relatively easy place to begin in identifying the effects of acid rain on water bodies. Dr. Webster and the ALC kept records from the 1950’s, before others began doing so. Records of their water sample tests, fish surveys, and other measured data were recognized as invaluable when Adirondack water bodies became devoid of fish. Their records of changes in pH values of water over time brought increased understanding to the problem. This entry was posted in admin and tagged Wende Carr on December 20, 2012 by Wende Carr. The Strand Theatre of Old Forge was awarded a $25,000 grant through Empire State Development to aid in its required digital conversion process. The funds were made available as part of the $738 million that was awarded by Governor Andrew Cuomo in round two of the Regional Economic Development Council initiative on Wednesday, December 19. CAP-21 assisted Strand owners Bob Card and Helen Zyma in securing the grant money which will be used to help ease the financial burden of converting the theater’s equipment to comply with the movie studios’ switch from 35 millimeter film to a digital format. It is expected that within the next year, all movies will be produced in a digital format, which will save the movie studios approximately $1 billion a year. However, their switch has forced many theater owners around the globe to shut their doors citing the cost of purchasing new equipment and the costs to maintain and upgrade the equipment every few years. According to CAP-21 Executive Director Nick Rose, the grant covers only about a quarter of the money needed to fulfill all of the requirements. However, he expects more money to become available thanks to the efforts of Senator Betty Little and a coalition of over a dozen North Country theater owners, which includes Card and Zyma. Hamilton County fared well as recipients of a portion of the $738 million that was awarded by Governor Cuomo during round two of the Regional Economic Development Council Awards on Wednesday, December 19. According to Nick Rose, executive director of CAP-21, the endowments awarded will allow for two projects that will have a much better, broader impact on the county. The first award in the amount of $1.3 million was made through Empire State Development (ESD) and will allow St. Lawrence Internet Communications to continue to create connections in Long Lake and surrounding areas. The second grant, also through ESD, was awarded to Hamilton County as part of Phase II of the Hamilton County Broadband Project. The county will receive $1.7 million to invest in broadband to most hamlets throughout the county. The current plan is to connect the areas along the Route 30 corridor in Indian Lake and down through the southern townships that include Wells, Lake Pleasant, and Speculator. “The expectation is that, hopefully, by the end of next year, most of Hamilton County will be wired,” Rose said.